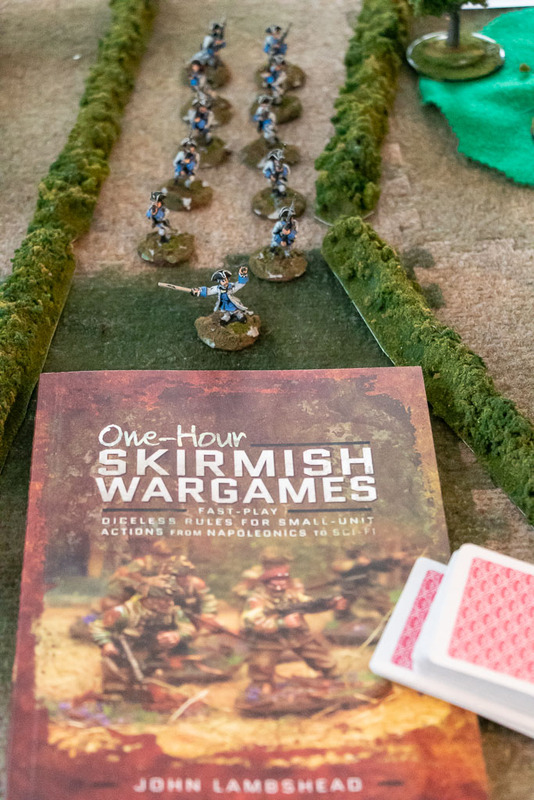 Pen and Sword books recently sent a review copy of a new set of skirmish rules from veteran gamer John Lambshead: One Hour Skirmish Wargames. We used the rules to play a fun scenario set in the French and Indian War. One Hour Skirmish is en entirely card driven game. Each player has a deck, and cards are flipped to determine turn order, activation points and combat results. In shooting, for example, players flip and compare the results of their cards. If the attacker’s weapon has a high rate of fire, he flips two or more cards. A defender in cover will flip two, three or four cards, depending upon the defensive situation. In any case, the high card wins. The result of all this card flipping is a fast-paced, and dramatic game. In a four player game, with around eight to twelve figures per player, we managed to finish in about an hour and a half. Everyone was satisfied with the results, and there were several moments in the game that left us talking afterwards, such as the stand of a British officer and a lone soldier against a large group of coeur de bois and natives. One of the reasons that the game plays so quickly is that there are no stat lines to track. Grunts are just grunts, and they are either down or out. It is possible to imbue figures with special capabilities, such as “Bruiser” or “Dead Shot,” but it is not the same as having Guy A hit on a 4+ and Guy B hit on a 5+ in more fiddly systems. The special abilities mostly just let you draw extra cards in specific situations. At some level, having the vast majority of troops with identical abilities make sense in a historical skirmish. On an individual level, it is unlikely that soldiers in the same time period in the age of gunpowder would have wildly different skill levels. The two areas where opposing forces could have different qualities in a given scenario are their motivation and leadership. The motivation score in this affects the side’s morale breakpoint. Leadership will affect the number of cards drawn when checking said morale. The One Hour Skirmish base rules are just ten pages long, and actually feel much shorter than that. The remainder of the hundred page paperback is dedicated to period specific scenarios and rules and a points system. The four of us who played all agreed that we would use these rules again and thought we might try a Boxer Rebellion game. We also agreed, however, that there are some in our larger gaming group who would likely not enjoy the rules. Those gamers tend to like more complicated systems, where differences in training, equipment and doctrine would be more closely modeled.